March 1, 1986: The Rock 'n Wrestling connection was still in full effect. The WWF was enjoying some main stream media coverage thanks to its union with MTV and rocker Cyndi Lauper. 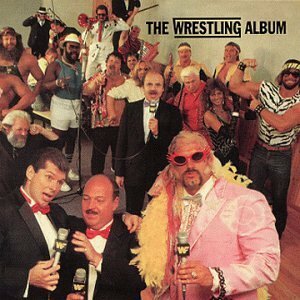 In 1985, the company released "the Wrestling Album", complete with different wrestlers singing songs. Some of those hits would become their own theme music. I still have my original vinyl album. I also have it on CD, which I've transferred into my iPod, and yes I do listen to it from time to time. The album, although cheesy, is pretty good (if you're a wrestling fan) But there's no way any of the songs, not even my favorite "Land of a 1,000 Dances" was going to win a Grammy award. So Vince McMahon and the powers at MTV collaborated on an awards show that was totally appropriate. And on that night in March 25 years ago, we got the first ever Slammy Awards. The Slammies aired on MTV. There was no in ring wrestling like we see now when the awards are presented during Monday Night Raw.